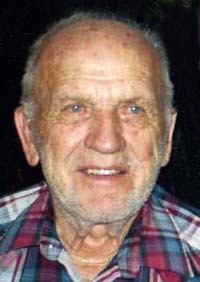 James Leland (Lee) Eldredge, 93, of Carey passed away Saturday, Dec. 22, 2012, of natural causes at Heritage Assisted Living in Twin Falls, Idaho. He was born on July, 26, 1919, in Carey, Idaho, the son of Worthington C. and Margaret McGreal Eldredge. He attended school in Carey and graduated in 1939. Lee served LDS mission to the Northern States Mission in Chicago, Ill. He enlisted in the Navy in 1943 and served as a projection specialist until 1946 when he was honorably discharged from the Navy. Lee married Mary Telfer on June 20, 1948, in Elko, Nev. They settled in Carey and raised three daughters. Early on, Lee was the local milkman delivering milk for Kraft to the local community. He was employed by the Idaho Department of Agriculture as a dairy inspector from 1953 to 1983 and enjoyed traveling around southern Idaho. After Jim Telfer’s passing, Lee helped Mary and Judy manage Telfer Ranch. Together they enjoyed running Angus cattle, raising hay and creating fabulous family memories in Fish Creek. He was a member of the Carey Riding Club, served on the Carey Fire District, Blaine County Planning and Zoning, and Idaho Soil Conservation, was the director for the Carey Valley Reservoir Co. and was director of the East Side Grazing Association. He was very involved with the Blaine County 4-H program and served numerous years on the Blaine County Fair Board. He enjoyed having his daily coffee at the Loading Chute, Sport Shop, Adamson’s and Castle’s Corner. Surviving are his two daughters, Becky Payne (Richard) of Carey, Idaho, and Lennie Uhrig (John) of Shoshone, Idaho; sister, Irene Barton of Twin Falls, Idaho; sisters-in-law, Judy Cenarrusa of Carey and June Eldredge of Salt Lake City, Utah; grandchildren, Nicki D’Orazio (Sam) of Carey, Idaho, Angie Peterson of Boise, Idaho, Rich Payne of Carey, Idaho, Marcella Blake (John) of Boise, Idaho, Monica Uhrig of Portland, Ore., and Howard Robinson of Twin Falls, Idaho; great-grandchildren, Tyson Payne, Nikolas D’Orazio, Gracie Peterson, Maggie D’Orazio and McCoy Blake; and numerous nieces and nephews. He was preceded in death by wife Mary, his parents, three brothers, Earl, Mac and Louis, and step-daughter Peggy. A funeral service will be at 1 p.m. Saturday, Dec. 29, at the Carey LDS Church. Interment will be at Carey Cemetery. In lieu of flowers, donations can be made to Visions Hospice, 1770 Park View Drive, Twin Falls, ID 83301. Arrangements are under the care of Wood River Chapel. Friends are welcome to share memories and photos or light a candle at  HYPERLINK "http://www.woodriverchapel.com" www.woodriverchapel.com.